Asia's major Art Fair, Guang Zhou International Art Fair has one of the longest history and records the highest transaction in China. 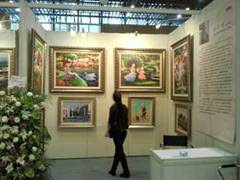 Hongbin is leading the trend of 2009 at the Guang Zhou International Art Fair in December last year. 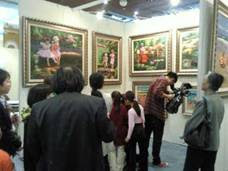 "Traditional Art is still leading the main stream this year in the 2009 International Guang Zhou Art Fair. Hongbin Zhao leading the traditional school of painting is the only VIP guest artist of the Art fair (He was given free prime locations as the major featured artist). Hongbin Zhao, the overseas Chinese artist is good at both figurative and landscape, his artworks of children topic are especially well-known worldwide. There are over 30 pieces of artworks exhibited...."